Posted on March 5, 2013	by . Use vertical shaped shelves, cabinets and furniture. These free up valuable floor space in tight rooms. Install wall shelves above doorways, the toilet and counters. These places would have otherwise been unused. Use ottomans to complement your sofa. This can serve as an extra seat and storage bin for books, magazines, and other knick-knacks. Mount fixtures (shelves, cabinets) and appliances (TV, sound system) on walls to keep floor space free for other things that can’t be mounted high up. Use a nice spot outside your home to entertain visitors such as a patio or shaded garden area to free up interior space. 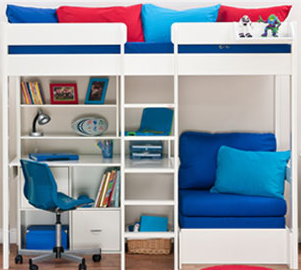 Use bunk beds for children’s rooms or multi-purpose beds with built-in shelves and work tables. Use corner shelves and cabinets. Corners are usually wasted space left empty. Get rid of clutter and store junk in cabinets. Clutter can make a room look smaller or crowded. Use less furniture and go “modern minimalist”. You can still enhance the look of a simply furnished home with art pieces and paintings on bare walls. These are some tips you can consider to make your small home feel and look more spacious. You don’t need a huge lot in Bacolod City to live comfortably. View the video below for more minimalist design ideas and how to enhance a simply furnished home with art work. This entry was posted in Centrale Bacolod, Video and tagged Centrale Bacolod, Centrale Bacolod Video, Home Design Tips, Lots for sale Bacolod, Video. Bookmark the permalink.